Sir David Attenborough, broadcaster and natural historian, pulled no punches as he addressed representatives of nearly 200 of the world's governments at the opening of COP24 in Katowice, Poland, on Monday 3rd. Representing the world's people, he said "Right now, we're facing a man-made disaster of global scale, our greatest threat in thousands of years: climate change. If we don't take action, the collapse of our civilisations and the extinction of much of the natural world is on the horizon." "Leaders of the world, you must lead. The continuation of our civilisations, and the natural world upon which we depend, is in your hands," he said. An excerpt from his speech and report on the opening was carried by The Guardian, and video of the full ceremony is here*, with Sir David's contribution beginning at 1:44:30. Described as the most important since the Paris Agreement of 12 December 2015, the Conference of the Parties (COP) is an annual meeting to track progress, ensure that climate action by governments is transparent and establish how climate finance is raised from rich nations to support climate action in developing ones. [UN, Reuters] COP24 has assumed greater importance because carbon dioxide emissions continue to increase and temperatures rise unabated, and it is becoming clear, as shown in the IPCC Special Report on Global Warming released in October, only extreme measures will now restrain warming below 2° by 2100. 2018 is likely to be the fourth warmest on record globally. The 20 warmest years have been in the past 22 with the top four in the past four years, according to the World Meteorological Organization (WMO). Meanwhile, the latest WMO Greenhouse Gas Bulletin [pdf] showed that carbon dioxide reached a record 405.5ppm in 2017, the highest in at least the past 3 million years. "The science is clear. Without rapid cuts in CO2 and other greenhouse gases, climate change will have increasingly destructive and irreversible impacts on life on Earth" said WMO Secretary-General Petteri Taalas. "The window of opportunity for action is almost closed"
The Conversation published three detailed backgrounders to mark the beginning of COP24: What must be agreed to keep warming at 1.5°;COP24: What to expect; and Ten years on from Lehman Brothers, we can't trust finance with the planet. Some key backgrounders that set the scene for COP24: More you need to know, and what's at stake [UN]; the draft statement on the Global climate in 2018 and this more digestible quick and easy summary [WMO]; and the signals and impacts of climate change in extreme and altered weather in 2018 [WMO/Reliefweb]. Finally, if you can keep up your practical optimism while those around you are losing theirs, The Guardian paints a grim Portrait of planet on the verge of climate catastrophe. It could be accused of needless scaremongering except that so much of what it says is borne out by the events of the past few decades and what is happening in the natural world. We must act and our leaders must lead with policies born of necessity. Mon 3 Dec 2018 WA: Severe storms roll from Wheatbelt to Goldfields. 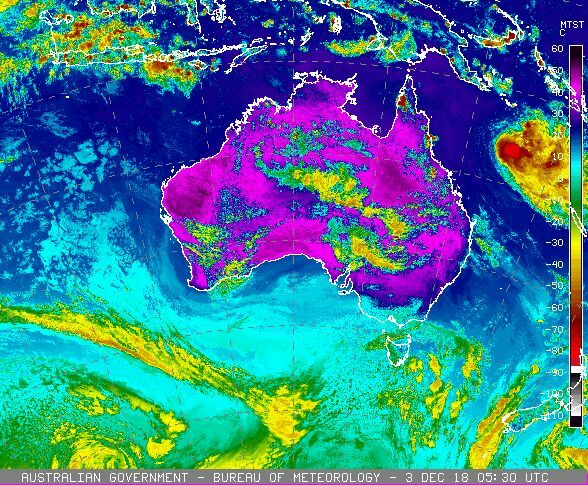 Severe thunderstorms brought heavy rain and damaging winds in a strip from the Central Wheat Belt and Great Southern to the Goldfields during the afternoon. Bencubbin recorded 19mm between 14.00 and 14.30 WST while farther east Kalgoorlie-Boulder Airport reported a wind gust of 113km/h in the early evening. But the real humdinger of a storm was saved for Laverton, 250km NNE of Kalgoorlie. The AWS there recorded a wind gust of 137km/h at the same time as 16.0mm of rain was dumped in 5 minutes to 17.55 WST. It was the town's highest gust for any month in 15 years of observations, adding 19km/h to the previous record. Obvious errors have been corrected, however this is realtime data which has not yet been validated. Full validation of official records by the BoM Quality Management System (QMS) is a much more complex process and may take some months. Go here for further information on this records section and how the QMS works. These provisional records are based on data received as at 1421 EST on 04/12/2018. Data is as received at 14:20EST, 04/12/2018.